Referencing a Custom Help Page with the Help.aspx page in SharePoint 2013 | Are you a user? If you look at the link provided by clicking on the help icon, you may see some links like these, once you navigate to the exact topic you want to view. Notice here you see AssetKey=. This appears to expect some semi-colon delimited GUID on the parameter value. I’ve found that using Key= is what you probably want to use. What I wanted to do was provide the exact topic in some sort of URL parameter. What I found is you can use this format. 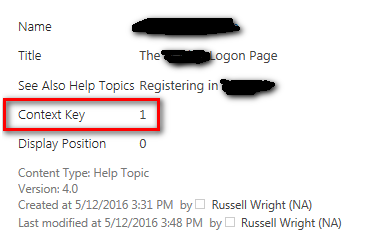 It is essentially the name of your folders you created in your custom help and the help page’s context key separated by underscores, e.g. Key=MyCustomHelpCollection_MyCustomHelpCategory_1. The missing piece here is the Context Key added on the end. This takes you directly to the page, without having to navigate through the Collection and Category. Note that the URL parameter name you might be tempted to use is AssetKey=, while the correct URL parameter name to use for this type of navigation is simply Key=. What does this mean? This means that after you create a custom help library by enabling the feature and creating some content, as discussed in these articles, you can link directly to your topics if you need to. It’s really possible this information exists somewhere out there, but I sure couldn’t find it after a couple hours of searching.